Looking for the Wednesday Wandering? Page back one, then amble along the stacks and let me know what libraries mean to you. Then join me and Alan as we continue our journey into the weird and wonderful worlds of Clifford Simak. 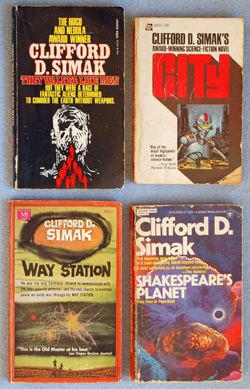 JANE: Last week we were discussing the works of Clifford D. Simak. We talked a lot, but I feel we barely scratched the surface of what makes him such a fantastic writer. From Cities to Shakespeare: Is Nothing Sacred? ALAN: I agree. Humour was always one of Simak’s major strengths. He was never totally serious even in his totally serious books – there was always a lightness of touch running through his deeper, more thoughtful works. But sometimes he just went for straight comedy, and of course he did it brilliantly. They Walked Like Men is an aliens-invade-the-Earth story, but it’s quite unlike any other such story you have ever read. (WARNING: A bit of a spoiler coming up). The aliens can turn themselves into any shape they like, though in their natural form they look like bowling balls. Initially, most of them turn themselves into money which they use to buy up lots of real estate – taking over the Earth by semi-legitimate means! Unfortunately the aliens have a serious weakness, they find the smell of a squirting skunk to be absolutely the most marvellous perfume ever. So defeating the invasion is simple. Just travel through town with an angry skunk in tow, and soon all the money in the bank will turn back into eager bowling balls rolling down the road in rapture. JANE: Oh, yes! I need to re-read that one. The resolution is silly – but the story is not. ALAN: Indeed so, and it is a measure of Simak’s skill that he can carry such an absurd story off quite brilliantly. It still makes me chuckle even today. JANE: Humor is a tough thing to pull off because what one person finds funny, another does not. However, Simak’s humor works for me, perhaps because it’s whimsical, even in its more overt moments. ALAN: Simak has been called a bucolic or pastoral writer and there’s a ring of truth in that. His most successful stories have a wistful nostalgia that harks back to simpler times and simpler people. Often there is a yearning for past glories. His two most successful novels, City and Way Station, are perhaps the epitome of this attitude. City is a fix-up novel built from a series of stories. It is set in the far future. People are long gone from the Earth. Only the dogs they loved and the robots they built are left to tell each other the old stories and to wonder whether human beings ever existed at all. JANE: Pastoral and nostalgic are not automatically the same thing but in Simak, you’re right, the two are often linked. If I recall correctly, one of the elements in City is speculation on how big cities would no longer be necessary in a future where everyone had their own personal flying machine. This was bucking in the face of common SF fiction and artistic tropes where towering cities and flying machines seemed inevitably linked. I think this is a good example of how Simak was both pastoral (showing a preference for a rural setting and lifestyle) and cutting edge SF, because he thought about the implications of how technology would change the manner in which people lived. Way Station is a gem… I think it’s Jim’s favorite Simak novel. You beat me to it, so you get to tell about it first! ALAN: Way Station is about a veteran of the American Civil War. He is the caretaker of a secret way station, a transfer point for aliens journeying to and from mysterious destinations. Inside his way station he never ages, though the time he spends outside the station does count against him. He makes many friends among the aliens who pass through. He learns a lot about the nature of the universe and they learn about the nature of the Earth. But the outside world is snooping around. His longevity is arousing suspicion and a crisis is fast approaching. JANE: Enoch Wallace is a wonderful character, simple but possessed of a deep, sophisticated wisdom. Again, under the guise of pastoral simplicity, Simak takes on some serious questions, including what is it at the heart of human nature that must be changed before peace is possible. A lovely book and one that fully deserved the Hugo it won in 1964. Simak has often been criticized for being “bucolic,” as if this meant he was unwilling to face the challenges of the world, but I firmly believe that this was far from the case. As Carter Horton, the protagonist of Simak’s novel Shakespeare’s Planet says, “It seems that our species at times may hold an almost fatal fascination for the past.” This “fatal fascination” is hardly passive nostalgia. I encountered Shakespeare’s Planet in a rather odd situation. Would you like to hear about it? ALAN: Yes please – somehow you, Simak and odd situations seem to go hand in hand. It all feels perfectly right! Shift the dials of the time machine slight forward. I’m a little older, though still in my teens, and it’s during the school term. I’m sick enough that not only am I permitted to stay home from school (a rare occasion) but I’m downstairs in my parents’ room so I can watch the television. My mom comes home with a stack of paperbacks for me. She knows I like SF, but at that point doesn’t read any so it’s great good luck that one of her random choices was Shakespeare’s Planet by Clifford Simak. It’s possible she picked it for the vaguely literary title. If she expected me to be getting a little covert education she was right, but not the sort she might have intended. The book was solidly weird. It featured an odd assortment of characters: a couple humans (from not only different places, but different times), a robot, an alien, and a spaceship with human brains installed in it. Oh! And a quite possibly insane human who called himself Shakespeare and is now dead, but remains a vivid character through the journal entries he left behind. All of them are stranded on a planet where once a day some powerful force strips their minds down to the barest elements. This God Hour was so strange that the first time I read the book I credited the high fever I was running with the weirdness. I re-read it later. I was wrong. It really was that weird. ALAN: I think it’s possibly the strangest book I’ve ever read. Simak had a genius for putting the oddest elements together and making a coherent story out of them. He proved it time after time. Shakespeare’s Planet is probably one of the more extreme examples of this technique, but it is by no means alone. JANE: Oh! I’m so very glad it’s on your “likes” list, too! The book wasn’t all special effects weirdness. Far from it. For a book published in 1976, it contained some neat SF speculation. The robot, Nicodemus, has multiple brains that enable him to function in a multi-purpose fashion. Today, where we’re accustomed to hardware and software, just how innovative this idea was would slip by most readers, but, in 1976, robots (and often computers as well) were single-purpose items. When software was first introduced onto the general market, I immediately thought of Nicodemus and understood what was going on. ALAN: Simak’s robots were always highly sophisticated, utterly different from the clanking monstrosities of traditional SF and different again from Isaac Asimov’s mechanistically sophisticated but philosophically quite shallow creations. I think Simak always regarded his robots as being self-aware, an idea that writers like Asimov played with but never properly came to grips with. And it is this self-awareness that lies behind Project Pope, probably one of Simak’s most profound novels, though the story is told in his normal, pastoral and often whimsical style, which makes the medicine slip down unnoticed. JANE: I agree… Project Pope is also a wonderful gateway into discussing an aspect of Simak’s writing that we haven’t touched on yet. I’ll leave that for next time. This entry was posted on May 1, 2014 at 1:00 am and is filed under Thursday Tangents. You can follow any responses to this entry through the RSS 2.0 feed. You can leave a response, or trackback from your own site. After last week’s tangent, I hit the library to what I could find by Simak. There were three novels on the shelf–Highway of Eternity, The Visitors, and Shakespeare’s Planet. Of these three, I liked Visitors the most. It deals with the economic, social and political implications of colonialism on the culture being colonized. I thought it was quite profound, and contained some good historical parallels. If there was a deeper philosophical meaning in Highway of Eternity, I missed it. Layers of manipulation and competing goals, maybe? No one is in charge of their own destiny? Post-modern dissatisfaction with our current societal trends? I missed the novelty of the hardware/software thing in Shakespeare’s Planet. I mean, of course you’d provide a robot with additional programming to meet a variety of tasks. I was born in 1980, and have had regular access to computers since about 1987…so this failed to surprise me. In retrospect, I can see that it’s a pretty cool prediction and showed a pretty good grasp of the technology and its potential for extrapolation. Other than that, this book was weird. The main point I got was that aliens are going to be very, very alien, and that communicating across species/cultures/time was tricky. The title also primed me to look for literary references. The climax at the end seemed to show some parallels to the end of Beowulf, but I don’t know if that was deliberate or coincidental. I also wondered if the diary entries (made in the margins, etc of an old edition of Shakespeare’s complete works) had any relation to the plays that were next to, and Simak was making thematic references to those plays. I remember Pericles and Timon of Athens (both more obscure than most of Shakespeare’s plays) being mentioned. But I’m not enough of a Shakespeare expert to have picked out any specific references that may have been there. Sometime soon, I may hit the used bookstore to see if I can pick up a few old paperbacks. I enjoyed being introduced to a new author. Thanks, Alan and Jane, for sharing these. I first read “They Walked Like Men” some 40 years ago and remember thinking it hilarious. I recently re-read it for a library book club and found it more scary than funny. Obviously it didn’t change over the years, so I must have. The only SF book I remember finding more funny was Chester Anderson’s “The Butterly Kid”; I’ll have to re-read that and see if it has morphed in the interim. Who we are at a given time does color how we react to what we read — I love this example.